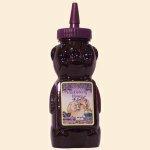 Clover Honey mixed with Wild Huckleberry Juice packaged in an adorable Plastic Bear Bottle. Clover Honey with real Wild Huckleberry Juice! Whip with butter to create a delicious Huckleberry Honey Butter. Bear shaped plastic bottle makes an adorable gift for any honey lover. Delicious on scones, biscuits & pancakes!